Welcome to the first episode of Coaching Soccer Weekly! We are joined by Scott Moody. 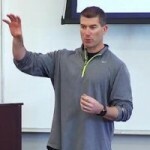 He is the founder and CEO of AthleteFIT and its sports specific academies. After ten years of success with the Center for Athletic Performance, one of the largest youth sports performance centers in the country, he is now focusing on developing a curriculum that bridges the gap between training the physical aspects of sports – speed, agility and quickness and blending them with the technical aspects of soccer to develop a player that can execute at a very high level as other players start to fatigue. Thousands of players have come through his program and many of them gone on to play in college, and the pros. I’ve worked with Scott for many years on training and testing programs for the teams I’ve coached through Sporting Blue Valley and I know you won’t find anyone with a greater understanding of the demands that soccer places on a player. Even more importantly he has the ability to develop training programs to help players reach their full physical and technical potential. There are dozens of topics that I could discuss with Scott but in this episode we focus on building a better warm-up. • What’s the purpose of warming up? • Should we be warming up the same way for training sessions and games? 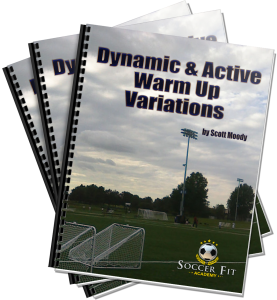 • Is it useful to create a standard warm-up that your players do every time or should we be altering it depending on the topic of the session? • In your book, ‘Dynamic Warm Ups for Soccer’ you talk about a seven steps process to warming-up. Can you walk us through that process? • Can you describe a sample warm-up that would use this process? • How is warming up for a training session that will include shooting different than any other session? • How much time should we plan for a proper warm-up? • How does this process change depending on the age and experience level of the players? o Which elements would you remove or combine with older or younger teams? • Should we alter our warm-up depending on the weather or time of day? • Which elements are coaches missing the most? • Is there a framework we can use to build our own warm-up and progress it over time? Click on the image below to receive copy of his eBook that will show you how to combine the elements we discussed to create you own warm-up. At the time of my interview with Scott the eBook was free. It now cost $10 to receive it. In an upcoming episode we talk with Stevie Grieve about the connection between the methods and tactics used at the top level and the development of youth players in clubs and academies. Sorry Alex. It was free for a time. I’ve updated the page. Thanks for letting me know about the change.